Professor Mary Visser teaches sculpture and computer imaging at Southwestern University in Georgetown, Texas. Ms. Visser has completed several large-scale public and private commissions the most recent being for the City of Austin, and Sprint Inc. Her work has been included in several multimedia and video presentations here and in Europe (e.g. The Computer: A Tool for Sculptors PBS, U.S.A., Clay Artists, America's Best, France, Texas Artists in Clay, London, England, Clay U.S.A., Boston and Atlanta.) Her work has been featured in Texas Monthly, Artspace, Ceramics Monthly, Sculpture International and in the book, A Comprehensive Guide to Outdoor Sculpture in Texas by Carol Morris Little. Visser's work has been included in over 108 international, national and regional juried exhibitions. Most recently her work was included in the International Digital Sculpture Exhibition sponsored by The New York Institute of Technology at the Rourke Art Museum in Minnesota in April of 2002. Her work has received numerous awards among which she received the "1990 Design Excellence Award" from the City of Austin Design Commission for her sculpture "Color At Play", a Mellon Technology Fellowship in 1998 for her work in multimedia, and a Mundy Fellowship for rapid prototyping in 2002 where she completed a Partnership in Stereo Modeling with PRISM Labs, Inc. at Arizona State University. Visser organized one of the first juried national digital art exhibitions for the Brown Symposium in the early 80s and has published several articles on women artists. Her most recent publication is entitled "Perspectives: The Interface: Computers, 3-D Modeling and Women Sculptors" for the International Sculpture Center web special at the url http://www.sculpture.org/documents/webspec/visser/women. 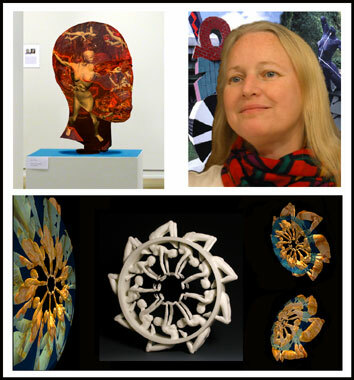 She has given numerous workshops on modeling digital sculpture and organized the rapid prototyping workshop for the 2000 International Sculpture Symposium in Houston, Texas. Ms. Visser was one of the curators for the International Rapid Prototyping Sculpture exhibition that has been touring since 2003. This exhibition has been shown around the world and last appeared at the Zoller Gallery at Pennsylvania State University in 2005. The exhibition will appear next In January of 2006 the exhibit will be at the DAAP Galleries at the College of Design, Architecture, Art and Planning, University of Cincinnati and in May 2006 at The Robert v. Fullerton Art Museum at California State University in San Bernardino, California. Most recently Visser received a Cullen grant to work with Accelerated Technologies to produce large scale rapid prototyped works of her sculptures in polycarbonate and bronze materials.